Enjoy luxury rustic living in this 2 bedroom, Den, 2 bath WATERFRONT condo on Lake Placid. Professionally decorated in an Adirondack Lodge theme using antiques and Orientals throughout. Beautiful mountain views of Whiteface Mt., surrounding high peaks and Lake Placid. Special features include cedar log trim, granite kitchen & bath, JACUZZI TUB, distressed hardwood floors, stone fireplace, 32' HDTVw/DVD in family room , 37' HDTV in master bedroom W/Roku, washer/dryer, fully-equipped kitchen. FIREWOOD PROVIDED in winter (other condos may not) & linens provided. Bedroom 1- new queen bed and a HDTV. Bedroom 2-new queen bed, and a set of bunk beds. Nordic Center at the Whiteface Club & Resort: Whiteface Club & Resort’s Nordic Center can be characterized as Lake Placid’s best cross-country center for the novice Nordic skier. The Whiteface Club & Resort Nordic Center provides 15 kilometers of gentle sloping, professionally groomed and track-set trails with skating lanes. Intersecting the Whiteface Club & Resort’s cross-country trails is the internationally recognized Jackrabbit Trail. The Jackrabbit Trail is thirty-five miles of backcountry trail meandering from the Adirondack Visitors Center at Paul Smith’s College, through Saranac Lake, Lake Placid to Keene Valley. The Whiteface Club & Resort’s Nordic Center offers a full range of Alpine ski equipment and snowshoes for rent. If you are not a skier but long to be out in the fresh fallen snow; snowshoeing might be alternative for you. Tennis at the Whiteface Club & Resort: The Whiteface Club & Resort boasts one of the most beautiful public tennis facilities in the Northeast. With six perfectly groomed clay courts, a full service pro shop and a comprehensive instruction program with experienced teaching professionals, the Whiteface Club & Resort is an ideal location for the tennis novice and enthusiast. We have a full line-up of children and adult clinics, leagues and tournaments, mixed double socials, and a player network program. Experience the beauty and challenge of one of this Country’s oldest golf courses, steeped in over 100 years of rich history. Originally built in 1898, the course was redesigned by noted architect, John Van Kleek, who benefited from the consultation of World Champion Walter Hagen. With the Adirondack Mountains and pristine Lake Placid as its backdrop, the artistically designed course offers novices and pros alike a rewarding day. Its trademark clover leaf designed greens and bunkers illustrate the meticulous attention to details the architect provided. The Whiteface Club & Resort golf house and pro shop offer a wide variety of quality golfing products. Join us on the covered deck overlooking the putting green and first hole for a casual lunch or beverage, or one of a variety of golf tournaments. We have rented our home for over 25 years and have had wonderful experiences with our guests. LOCATION and VIEWS. Only condos in Lake Placid with all these amenities available - on site waterfront, beach, golf and tennis. Also 2 on site restaurants in summer season. The views of Lake Placid and the surrounding high peaks are beautiful. Free Beach access when renting our home. Bathroom 1- 2 Person Jacuzzi Tub, Full Size washer/dryer, towels provided, hair dryer, make-up mirror Bathroom 2- Full Bath, hair dryer Both bathrooms newly renovated with granite counters, birch bark cabinets in Adirondack Lodge theme. Free Beach Access with our condo. Not available with all condos. Whiteface Mt. Ski Center- Home of the 1980 Winter Olympics. 15 minute drive from the condo. Boat rentals available. Lake front restaurant during summer season. Closest condo to the lake and beach area. Beautiful views of Whiteface Mt. and the surrounding high peaks. Beautiful view of Lake Placid and surrounding high peaks. On site Marina with boat rentals available. Roped off swimming area with float, Adirondack chairs. On site 18 Hole historic Golf Course with Pro. Tennis Center with 6 Hard Tru courts and Pro, 2 restaurants on site- 1 at the Marina, 1 at the Golf Club House open during summer season. Our condo offers beach access to guests.- not all Whiteface Condos do and you may have to pay additional fees. We stayed over Christmas in this condo... the view was magical and the owners so kind... this is a perfect 2/2 condo to stay in. The attention to detail for comfort was just so nice down to the heated floor as you step out of the shower.. just lovely. We couldn't be happier with this Christmas week there.... will be back for sure!! Adirondack Critter-couture at its best! This condo was perfect for our stay while attending a wedding at Whiteface Club and Resort. We could see the wedding venue from the deck, with a glorious view of Lake Placid in the background. The condo was clean and comfortable with lots of homey touches and suited my husband and I and our 3 adult children quite well; we hope to stay again someday. Jeannine was a delight to speak with, offered many suggestions, and even responded from Mt Kilimanjaro when I had a question! What a wonderful stay! The condo had everything we needed and felt like home. Jeannine was always available if we had questions and provided all of the information we needed to make our stay comfortable. The views were breathtaking! Walk to the beach, restaurants, the marina... the location was perfect! We look forward to staying here again next summer! We miss it already! Thank you for being great guests and treating our home as your own. We would love to have your return again. Enjoy the rest of your summer. Me and a couple buddies of mine decided to have a weekend away where we were looking for the ultimate escape for a few days. Jeannine was the owner of the property and within hours of the booking she contacted me and we made it happen. She was very helpful and gave us a lot of detail about the property and the different activities around the location of where we were staying. The house itself is in very good condition, offering free WiFi and cable. The property had an amazing view of the lake and surrounding mountains. There was endless fun activities and cool places to have a drink and hangout with everything within a 10 minute drive of the place. Overall we had a great experience and I would absolutely consider returning in the future. We loved the condo - so many lovely touches - has inspired me to redecorate at home!! Everything you need and close to all activities, shopping and restaurants. Ideal location! Easy to book, great communication!! Excellent experience! Thank you! Thank you Maria. We love guests who enjoy our home and would love to have you again as a guest when you visit Lake Placid. This condo is incredibly clean and well-equipped. It had everything we needed, even firewood! The kitchen was stocked with all of the little things you typically have to bring, spices, dish soap, corkscrew, etc. This place had it all. The view was beautiful and was close to shopping and the downtown area of Lake Placid. Definitely a good choice to rent here. The owners were super-accommodating and pleasant to deal with. They went out of their way to ensure we had a pleasant stay. We are so glad that you enjoyed our home. Thank you for the review and we would love to have you return on your next trip to Lake Placid. 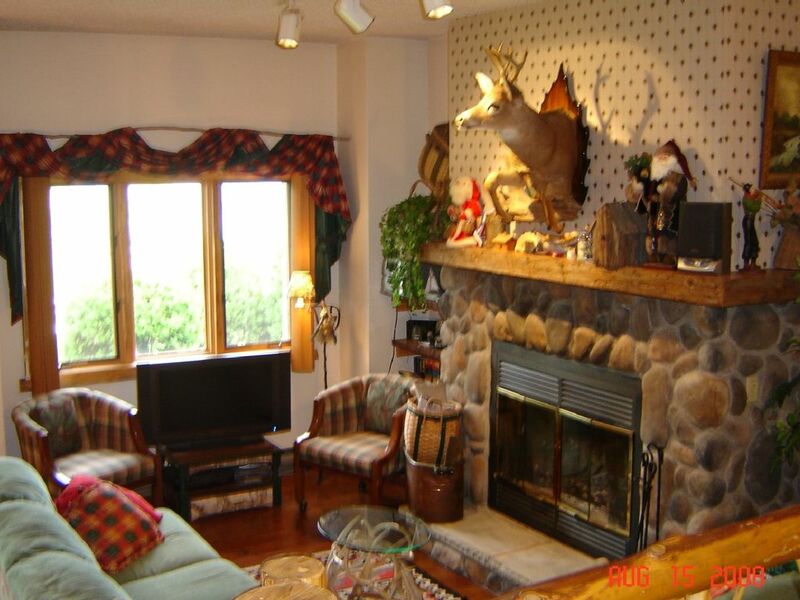 Professionally decorated WATERFRONT condo on Lake Placid at the Whiteface Club. On site marina with waterfront restaurant, boat rentals, 18 hole historic golf course with restaurant, tennis center with 6 Hard Tru courts. Private lessons or clinics available for golf and tennis. FREE BEACH ACCESS, FREE WI-FI, 32' HDTV. Hike the High Peaks of the Adirondack Mts, Ski at the 1980 Winter Olympics Mt.-Whiteface, or go Mt. biking in the summer, Tour the Olympic Sites and go for a Bobsled Ride, Enjoy fine restaurants, take a Tour of the lake on the historic 'Lady of the Lake', take the elevator to the top of the ski jumps and view the scenic Adirondack Mts. The Whiteface Club offers on site Golf, Tennis, Marina, and in the winter Cross country skiing, Sleigh Rides. Security deposit required. 1/2 payment plus security deposit. Remainder is due 1 month prior to arrival. Peak- $300/night, $2100/week. Summer-minimum stay of 1 week. Lower rates available for non-peak times during fall and spring.